An easy and healthy dinner idea, this Creamy Roasted Red Pepper Pasta Alfredo Recipe is all kinds of good! Full of flavor, and smothered in creamy Alfredo sauce, it’s hard to believe that each serving is just 5 Points. The jarred Alfredo sauce makes this a super easy dinner recipe, and it aso helps to cut down on the calories a lot. And bulking up the Alfredo sauce with a bit of non-fat Greek yogurt helps add protein and texture without adding a lot more Points. The end result is perfect – a rich and creamy Pasta Alfredo. The added mushrooms and roasted red peppers help contribute delicious flavors and also help add some bulk to the dish, giving you more bang for your buck. Pair this Alfredo pasta recipe with a low calorie salad and you’ve got a fantastic Weight Watchers dinner that tastes amazing and will still keep you on track to reaching your weight loss goals. 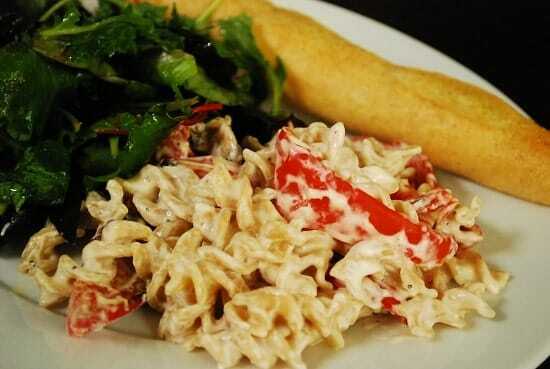 A creamy and flavorful pasta dish, it’s hard to believe it is Weight Watchers friendly! Who says you can’t have pasta Alfredo when dieting? This is one delicious pasta recipe! Spray a baking sheet with non-stick cooking spray, and place red pepper strips on it , and allow to cook for about 20 minutes, and then add in the mushroom slices and garlic slices and return to oven. Continue cooking until the skins on the peppers begin to blacken well, about another 10 minutes or so. Transfer red pepper strips to a sealed Tupperware container and let sit until strips cool. Set aside mushrooms & garlic. Meanwhile, prepare pasta according to package instructions. When pasta is ready, drain and transfer to a large pot. Peel skin off cooled red pepper strips and add into pasta. Heat jarred alfredo sauce in a medium sized sauce pan, and add in mushrooms and garlic to it.Heat until warmed through and hot, about 5-8 minutes. Stir in Alfredo sauce, yogurt into pasta and peper mix and add salt and pepper to taste. Mix well, to combine. Serve immediately. Any suggestions of an alternative to the mushrooms for non-mushroom lovers? I was considering artichoke hearts…I’ve made fettuccine with those before. Love you site, thanks for the great recipes! I made some alterations based on the comment below and it turned out great! I instead broiled the red pepper pieces (bigger to make peeling easier) for 15 minutes, watching them carefully, and they blackened nicely. The peeling was still a big time consuming, but it was also my first time doing it. I left out mushrooms because I don’t like them and just used minced garlic in the sauce. I also added some basil, crushed red pepper, and parsley to the sauce for some extra flavor and it was delicious; I loved the flavor of the roasted red pepper! I made this last night and had major issues. First off, the peppers were FAR from being cooked and blackened after 20 minutes in the oven. Since my pasta was done, I had no choice but to use them as is, which were basically raw. Since the skins weren’t cooked enough it was nearly impossible to peel them. Even if they had been cooked enough, I think it would’ve been much easier and made much more sense to bake the peppers in larger pieces and then cut them into slices after peeling them. Also, I put the garlic slices in the oven for 10 minutes and they were burnt to a crisp.. the recipe never said anything else about the garlic, so I just threw it out and used garlic powder instead. The mushrooms were also way undercooked after only 10 minutes in the oven. The recipe tasted ok, but wasn’t anything different from what I’ve done in the past – wouldn’t really call it a recipe, it is just peppers and mushrooms thrown in with some pasta and jarred alfredo sauce -oh and the yogurt (which was nice because it thickened it a little bit). Next time, I’d just use jarred roasted peppers which would be MUCH better, cook the mushrooms for at least 20 minutes in the oven, and put fresh garlic into the sauce. (oh, I also heated the alfredo sauce before putting it on the pasta. I’m assuming that was a missed step, unless you want to eat hot pasta with cold sauce on top of it). Thanks for the feedback! I’m sorry this recipe didn’t turn out the way you had expected. I realized that when writing the instructions, I left out a few details. I also added some small changes and updates.